It is a new year - our league has had a busy year!! 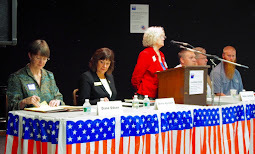 Our most recent endeavor was a very successful Candidate Forum!! Thanks to all of you. But as things flow from Washington and from Madison, it becomes clearer and clearer that the right to vote, the ease to vote is under siege. Voter suppression is at an all time high. And it isn't over!!! But there are lawsuits against the onslaught - against attempts to restrict voter participation - against the gerrymandering in many states around the country. "The treacherous trail that connects the remote Sherpa village of Tempathang , in the Himalayas, to the rest of the world was unusually crowded over the last weekend of November as scores of voters walked for hours across narrow mountain ridges to vote in Nepal's first parliamentary elections since 2006"
Mothers carried babies in slings and baskets, many people camped the night before the day to vote, people had walked many many miles --- TO VOTE!!!! We did something similar in this country once upon a time. People - women in particular, went to jail to get the chance to vote. People marched - people sat in ---- And we are doing this again!! Many new organizations have been formed specifically to focus on voting and non-violent protests of the incredibly inane, inaccurate and illegal actions coming out of the current administration. But with a National 46% voter turnout - I worry!! What can we do to change this??? It reinforces the League's continued focus on Voter Rights--Voter Registration--Voter Education. As we move forward this year - an election year - let's focus on this issue - let's get many more registered to vote in Polk and Burnett Counties - let's reach out to other's to encourage them to vote - to offer transportation, to help register to vote, to counter the discouraging opinion that our vote doesn't count - BECAUSE WE KNOW IT DOES COUNT!!! Every vote counts and we can do this!!!! -- WE CAN DO BETTER than 46%!!! AND LET'S CONTINUE BUILDING OUR LEAGUE!!! Let's continue moving forward in this New Year.